Netflix, Amazon and BT where early adopters of the new Ultra High Definition [UHD], 4k technology for streaming content. For the world cup in 2018, even the BBC got in on the act with a restricted number of 4k enabled TVs being able to stream matches live in the new resolution. Should we see this as a turning point and acknowledge that, just like the introduction of High Definition [HD] way back in 2009 – UHD 4k is the future of broadcasting and therefore streaming technology? Let’s start with what is 4k? Essentially it’s an increase in the number of pixels on display and therefore the quality. It’s more than that too as with High Dynamic Range (HDR) the difference between darkness and light is clearer and colours are more pronounced but let’s focus on the resolution difference for now. Resolution is typically measured in the height of the image (see right). A typical DVD will be 480 pixels high. 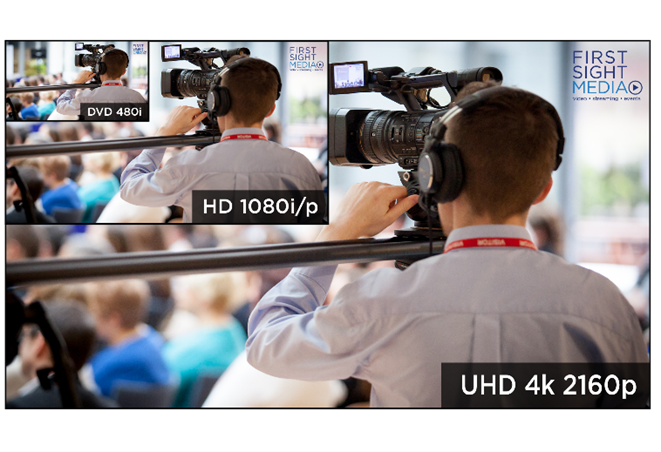 The HD we have all become used to is 1080 pixels High but 4k is 2160 pixels high – double the height of HD. The 4k comes from the width which at 3840 is as close to 4,000 as a 16:9 aspect ratio will allow with HD being occasionally referred to as 2k. (In case you’re interested, the i and the p you often see next to these numbers – e.g. 1080p – stands for progressive or interlaced and is about the number of frames shown per second. In the UK this is typically 25 for interlaced and 50 for progressive – so p is the better). So should we all start buying 4K TVs and monitors? Well, in a word, yes - but only if you are planning to buy or upgrade your system anyway… don’t rush out. 4k TVs and have been on the high street for long enough that the manufacturers have recouped their development costs and prices are sensible so there’s no need to buy HD anymore. If you’re buying new, buy 4k - particularly if you’re buying a screen over 50” as this is where UHD starts to really show. That said, 4k take-up – like HD before in 2010 – has been slow with less than 5% of TVs currently 4k ready. This plummets further when we start talking about computer monitors – where most people will view streams. Even at First Sight Media only less than 10% of our screens and monitors are 4k ready. What does this mean for video production? If you or your business are planning on producing a promotional video, speak to your provider about whether it can be 4k – you might as well future proof your content. Most video production companies will have 4k ready equipment and shooting in UHD shouldn’t been too taxing for them but they might not do it as standard so if you want it done, be sure to ask. Will I need to upgrade my broadband to watch 4k? Here’s where it gets interesting as watching a 4k stream takes a lot less bandwidth than you might think. Streaming – like your internet speeds – is measured in Megabits per second or mbps. A standard definition stream will typically be less than 1mbps and most internet connections in the Uk are now capable of this. High Definition streaming varies but the BBC streams at around 5mbps for their HD content. 4k also varies – Amazon recommends your broadband connection is at least 15mbps whilst Netflix suggests 25mbps. There is no industry standard for this but at First Sight Media we stream 4k at around 20mbps but YouTube will accept a data rate of up to 34mbps. In practice most broadband connections are capable of handling this – especially if you have a good business line. It would not be unreasonable to suggest that the lack of a 4k monitor to view the content is likely to be a larger sticking point than broadband speeds. You should also find that a good streaming provider such as First Sight Media will stream using adaptive technology – meaning if your connection isn’t capable of viewing in 4k, you will be automatically downgraded to the lower quality version so you don’t miss out or experience horrible buffering. Want to see what all the fuss is about? First Sight Media will be streaming in 4k live from Event Tech Live 2018 on 7th and 8th November. We are also capturing every second of all stages in 4k to make available on ETL’s YouTube channel so why not decide for yourself?